please help i need my WoW fix and i hate to have my pass stolen. Edited by wataka, 03 April 2008 - 01:28 PM. this trojan is like an uppity 2 year old, ithink i sent him to the vault for the final time, and it pops its freckled face everytime i contiplate heading into WoW. Hello and welcome to Geeks To Go! My name is BHowett and I will be helping you to get sorted. If for any reason you do not understand any of the instructions, or are just unsure then please do not guess , simply post back with your question, and we will go through it again. For Technical Support, double-click the e-mail address located at the bottom of each menu. Type notepad .exe in the Run Box. 4. Then drag the CFScript.txt into ComboFix.exe as depicted in the animation below. This will start ComboFix again. Click on the tab "Misc Tools"
click on "delete an NT service"
Now close all windows other than HiJackThis, then click Fix Checked. Close HiJackThis. Reboot into safe mode. Looking good, everything found seems to be in Quarantine or system restore points and we will clear all that out shortly. Please copy (Ctrl+C) and paste (Ctrl+V) the following text in the quote to Notepad. Save it as All Files and name it "FixServices.bat" (including quotation marks). Please save it on your desktop. Double click FixServices.bat. A window will open and close. This is normal. Then reboot your computer. Now type Combofix /u in the runbox and click OK. Note the space between the X and the U, it needs to be there. Please post one more fresh HijackThis log. 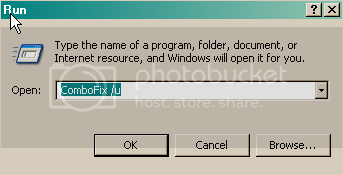 un-installed combofix, do i keep the new batch file? Nice work your system is clean and your logs are looking good, lets clean out your restore points and were done!! This is my standard post for when you are clear - which you now are - or seem to be. Please advise me of any questions or problems you still have. I know you already have some of the programs like Antivirus, or 3rd party firewall, but I still like to share the information incase you ever need it, or want to change them. 1.) Watch what you download! Many freeware programs, and P2P programs like Grokster, Imesh, Kazaa and others are amongst the most notorious, come with an enormous amount of bundled spyware that will eat system resources, slow down your system, clash with other installed software, or just plain crash your browser or even Windows itself. If you insist on using a P2P program, please read This Article written by Mike Healan of Spywareinfo.com fame. It is an updated and comprehensive article that gives in-depth detail about which P2P programs are "safe" to use. 2.) Go to Intenet Explorer > Tools > Windows Update > Product Updates, and install ALL High-Priority Security Updates listed. If you're running Windows XP, that of course includes the Service Pack 2! If you suspect your computer is infected with Malware of any type, we advise you to not install SP2 if you don't already have it. You can post a HijackThis log on our Forums to get free Expert help cleaning your machine. Once you are sure you have a clean system, it is highly recommended to install SP2 to help prevent against future infections. It's important to always keep current with the latest security fixes from Microsoft. Install those patches for Internet Explorer, and make sure your installation of Java VM is up-to-date. There are some well known security bugs with Microsoft Java VM which are exploited regularly by browser hijackers. 3.) Open Intenet Explorer and go to Internet Options > Security > Internet, then press "Default Level", then OK. Now press "Custom Level." In the ActiveX section, set the first two options ("Download signed and unsigned ActiveX controls) to "Prompt", and ("Initialize and Script ActiveX controls not marked as safe") to "Disable". Now you will be asked whether you want ActiveX objects to be executed and whether you want software to be installed. Sites that you know for sure are above suspicion can be moved to the Trusted Zone in Internet Option > Security. So why is ActiveX so dangerous that you have to increase the security for it? When your browser runs an activex control, it is running an executable program. It's no different from doubleclicking an exe file on your hard drive. Would you run just any random file downloaded off a web site without knowing what it is and what it does? It will protect you from most spy/foistware in it's database by blocking installation of their ActiveX objects. Download and install, download the latest updates, and you'll see a list of all spyware programs covered by the program (NOTE: this is NOT spyware found on your computer) Press "Enable All Protection", and you're done. The spyware that you told Spywareblaster to set the "kill bit" for won't be a hazard to you any longer. Although it won't protect you from every form of spyware known to man, it is a very potent extra layer of protection. Don't forget to check for updates every week or so. 5.) Let's also not forget that Spybot Search & Destroy has the Immunize feature which works roughly the same way. Another feature within Spybot is the TeaTimer option. This option immediately detects known malicious processes wanting to start and terminates them. TeaTimer also detects when something wants to change some critical registry keys and gives you an option to allow them or not. 6.) Microsoft now offers their own free malicious software blocking tool. Windows Defender improves Internet browsing safety by guarding over fifty (50) ways spyware can enter your PC. 7.) Another excellent program by Javacool we recommend is SpywareGuard. It provides a degree of real-time protection solution against spyware that is a great addition to SpywareBlaster's protection method. 8.) IE-SPYAD puts over 5000 sites in your restricted zone, so you'll be protected when you visit innocent-looking sites that aren't actually innocent at all. Another good hosts program is mvpshosts. This little program packs a powerful punch as it block ads, banners, 3rd party Cookies, 3rd party page counters, web bugs, and many hijackers. For information on how to download and install, please read this tutorial. 10.) An Anti-Virus product is a necessity. There are many excellent programs that you can purchase. However, we choose to advocate the use of free programs whenever possible. Some very good and easy-to-use free A/V programs are AVG, Avast, and AntiVir. It's a good idea to set these to receive automatic updates so you are always as fully protected as possible from the newest virus threats. NOTE: DO NOT install more than one anti-virus program. They will conflict, and provide less protection, not more. Update all these programs regularly - Make sure you update all the programs I have listed regularly. Without regular updates you WILL NOT be protected when new malicious programs are released. Follow this list and your potential for being infected again will reduce dramatically. Thanks for letting us help you! Edited by BHowett, 08 April 2008 - 02:10 PM. the only question i have is this: with all the protection that i have on my computer wouldn't adding more programs create conflict? i do trust avg virus cleaner to do the job although in this case i guess it was caught with its pants downi'm still running it along side adaware, should i also uninstall/delete the following hjthislog dss atf-cleaner? all of the programs/files in my closing speech down to number 8 can be run simultaneously on your system. They will work together in layers, so to speak, to help protect your computer. However for numbers 9 & 10 in my closing speech we don't recommend installing more than one anti-virus program or firewall program. They will conflict, and provide less protection. I just give them to you in my closing speech incase you ever need them. should i also uninstall/delete the following hjthislog dss atf-cleaner? Yes you can uninstall all of them, however I would recommend keeping ATF Cleaner, it is a handy tool to have so you can clean out all your junk temp files, cookies, etc.. every so often. I use it on my system about every three days to clear up the junk.